With UML Lab Class Diagrams for Eclipse we provide a light-weight but highly professional software tool for creating and editing UML class and package diagrams with your Eclipse IDE. 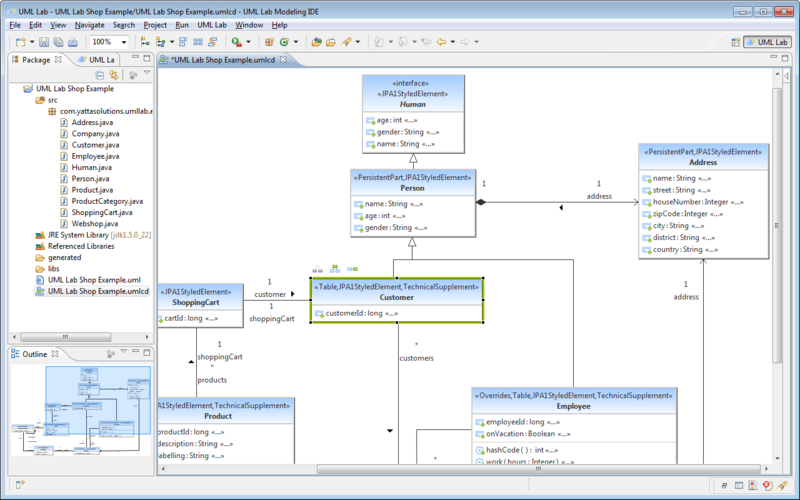 Take a look at UML Lab for our full-featured agile modeling solution. How does the »UML Lab Class Diagram Editor for Eclipse« work? Install UML Lab (the full edition or just the class diagram editor) into your Eclipse IDE and use the editor for a month at a time whenever you need. After your usage period expires, the editor functions are disabled again. Our vision is for Eclipse users to no longer buy tools in bulk, but to use specific functions in their Eclipse IDE flexibly and on demand. You only pay what you need. Our UML Lab Class Diagram Service for Eclipse is a first step in that direction. Monthly licenses are available from EUR 19 including support and updates; Academic Licenses are free. Visit our website for more information. Follow the latest Yatta News on Twitter, Facebook and on Google+. We are interested in your feedback and suggestions regarding our UML Lab Services – or Eclipse in general – good or bad alike: Just contact us or post your question in our forum. As Eclipse Solution Member, we strive to create custom-made software tools that match your needs and compel with efficiency, quality and creativity. By adding the following code below to your website you will be able to add an install button for UML Lab Class Diagram Editor.